I can’t believe we’re already finished with Week 3 of the Pantry Challenge. So far, so good. Here’s how we did this past week. It rained almost the entire week. Not something we normally experience in San Diego. While I’m thankful for the precipitation, I am so thankful for the sunshine that finally broke through on Friday afternoon! The weekend has been a weird one, being a holiday and all, so I am a little late in posting this report. But, since tomorrow is the Monday that will feel like a Sunday, I decided not to worry about it too much. As I mentioned earlier, I plan do to this Pantry Challenge all the way through the end of January. I officially started my reporting the Sunday before New Year’s. Only ten more days to go! My general plan is to spend only half of our monthly budget (currently set for $1000/month for the new year) by shopping my pantry and freezers before I go to the store. 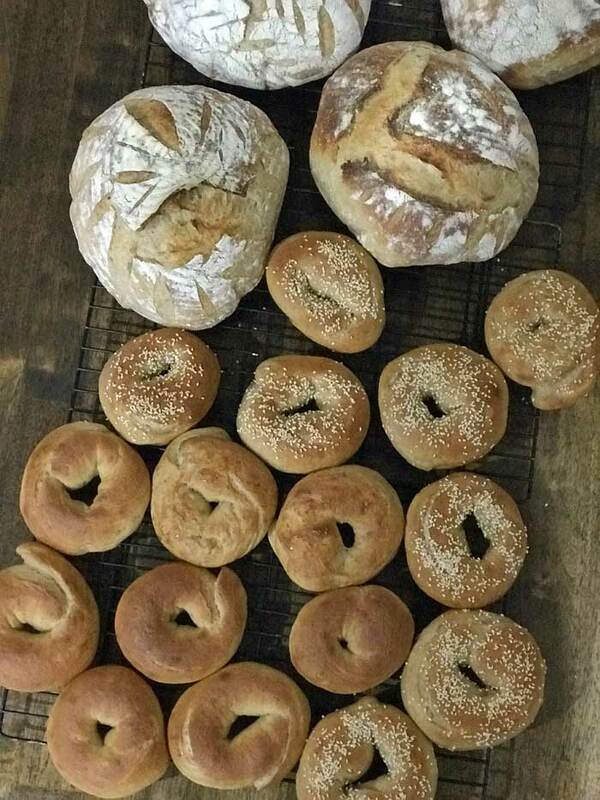 I’ve focused on making more things from scratch and making good use of leftovers. I’m not sure if I will really squeak in under $500, but I think it will be close. Sign up for my emails. 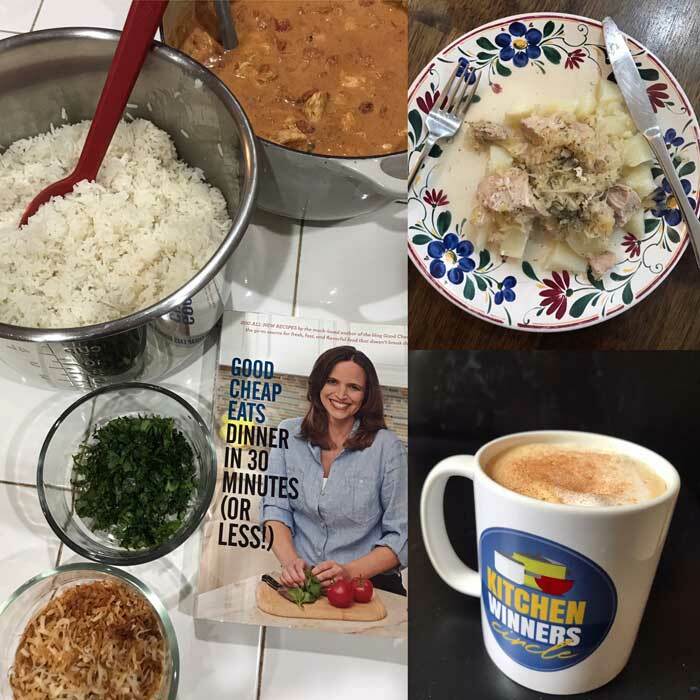 During January, I’ll be sending out specific tips and tricks to help you make the most of the food you already have in your cupboards. Sign up for the emails here. Watch Kitchen Winning. I’ll also be chatting about the challenge in this month’s episodes of Kitchen Winning. 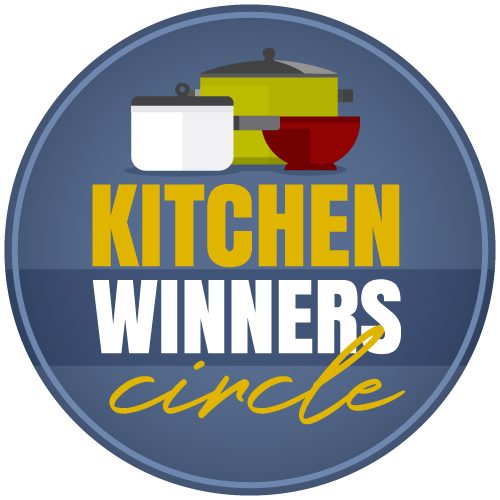 Join the Kitchen Winners Circle. January’s focus in the Kitchen Winners Circle is the Pantry Challenge. Naturally. 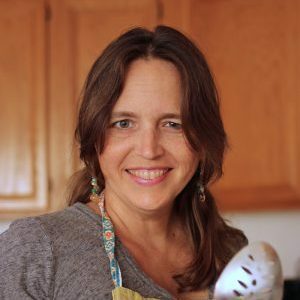 I’ll be offering personalized coaching to folks in the circle and sharing my daily menues from our family’s Pantry Challenge. We’ll also be chatting in our private chat forum about what we’re making each day and getting help and inspiration from each other. Our first master class was on how to make the Pantry Challenge work for you so that you can make the most of what you have. 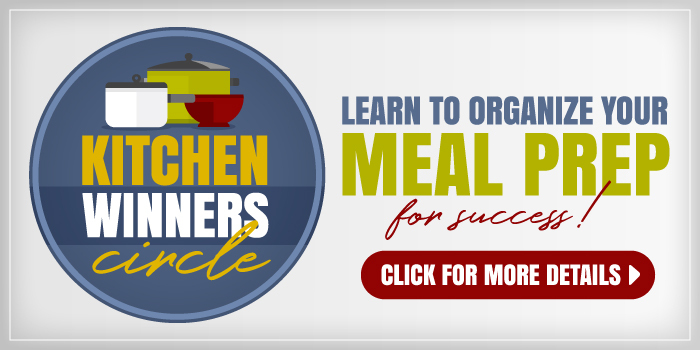 The class and its replay is free to all members of the Kitchen Winners Circle. Despite the rain, it was a pretty good week. 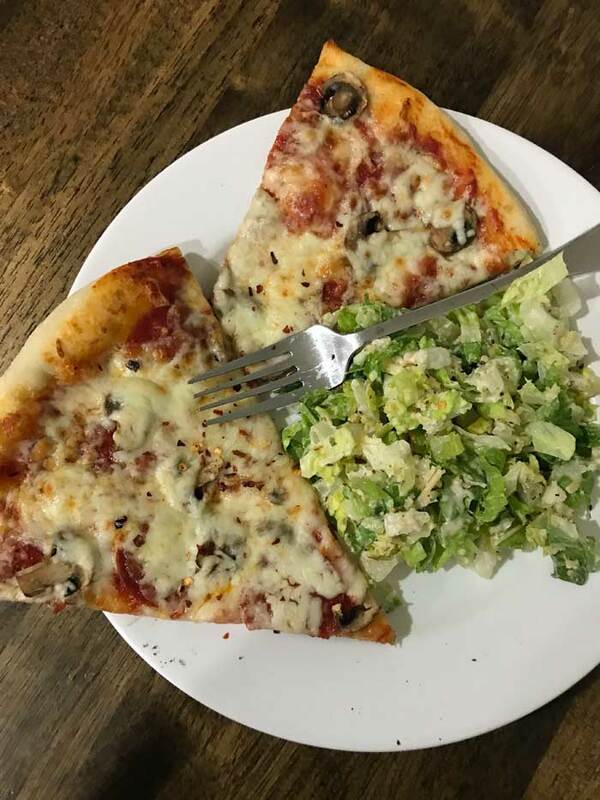 We were able to use up some more things from the fridge, make good use of leftovers, and keep our grocery spending fairly low. I consider this the doldrums week of a Pantry Challenge, the time when I notice my kids are hungrier and I feel uninspired in the kitchen. To combat this, I wasn’t afraid to have my daughter bake up two batches of Gramma John’s Crispy Chocolate Chip Cookies to get us through. I also gave my 14yo carte blanche on the crackers, one of his favorite snacks. We also had a burger lunch out; something we’ve not done all month is eat out, so it was time. Sunday lent itself to brunch. It was not by design, but it’s how it worked out. I’m totally fine with that, particularly on a day when I do a lot of meal prep. Somehow I didn’t think to take pictures of breakfast or dinner, but I did get a shot of my Split Pea Soup that I prepped on Sunday. So yummy! Monday was rainy and full of school doings with the kids. I was busy all day and we didn’t eat until almost 8! Dinner turned out to be less than I had hoped. Somehow the kid I assigned to peel potatoes didn’t peel enough, so when I was prepping dinner, I realized people would leave the table hungry. I cooked up a package of sausages and fried some eggs to make sure people left the table full. I like Burning Love Mashed Potatoes without sausage, I think. Dinner: Oven Tacos. I use a Homemade Chipotle Taco Seasoning Mix. Tuesday was an at-home day, but it rained and felt blah. We had sourdough toast with the best raspberry jam. Costco has this French organic jam that is amazing. I stocked up over Christmas. For lunch I used up the leftover wontons we had as well as some random meats from the freezer (cooked pork and breakfast sausage). I also baked up some frozen appetizers I had leftover from NYE. At dinner time, I made a few pans of Oven Tacos. These are a favorite with the people here. 24 isn’t quite enough for 8 people, however, so kids also ended up making quesadillas and burritos. Another busy, rainy day. We ate leftovers and fairly bland colored foods. 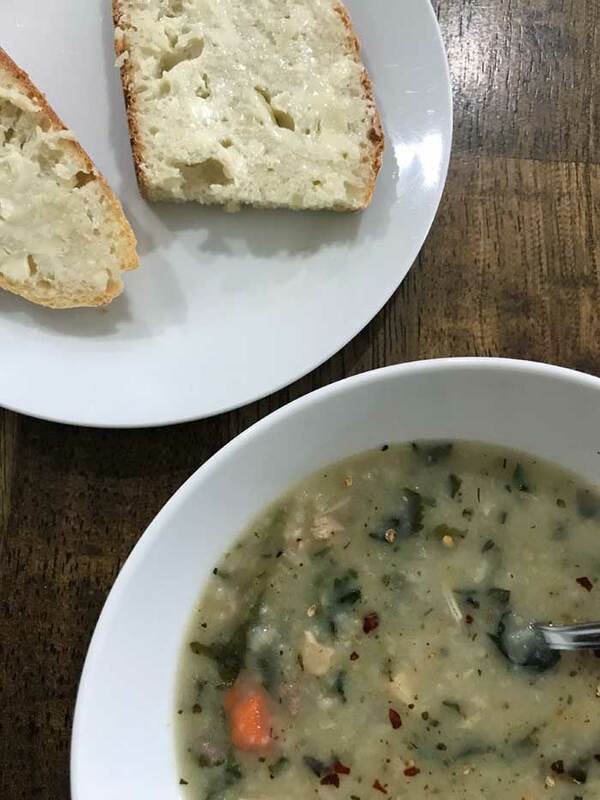 Though this wild rice soup from Week 1 is still amazing! Will need to recreate that again. I heated up the last container from the freezer. By Thursday I was done with the rain and the sickness I’ve been fighting all week. I couldn’t handle another bean or soup dish, so I dug out my 30-minute cookbook for inspiration. Lo and behold! I had all the things for Chicken Tikka Masala. Soooo yummy and just what we needed to mix things up a bit. I had to make my own garam masala but it worked out okay. Yay! I had leftovers that I froze. The kids and I will have them for lunch this week. Friday was sunny and bright so we celebrated with an easy lunch out and then made our regular Grilled Sourdough Pizza. I had found a few bagged salads on clearance at Ralphs, so that made for an easy side dish. Saturday, Bryan and I were filming some more cooking videos so the kitchen was busy all day. The kids had cereal while we worked. 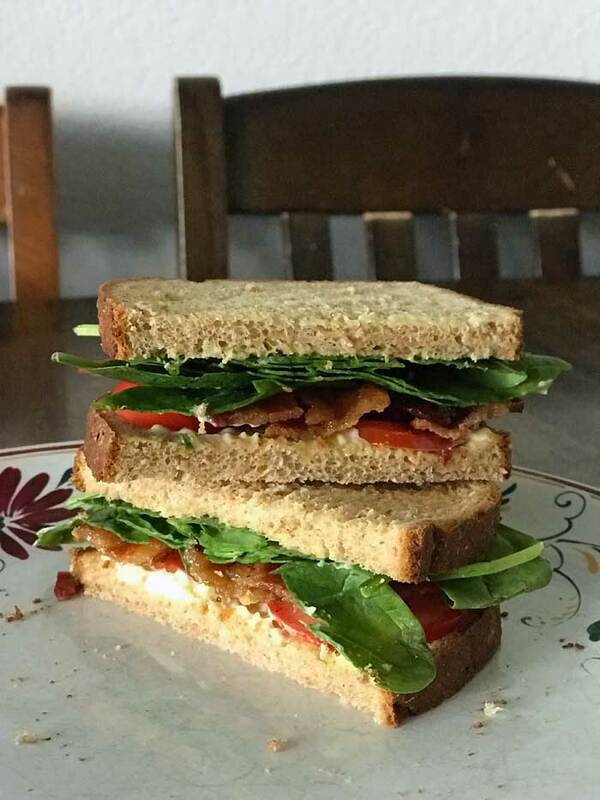 Then we broke for lunch with BLTs on bread I bought on clearance. Told you — doldrums week. Dinner was a quick enchilada casserole. If you’ve got the chicken cooked — I poached chicken in the Instant Pot — the casserole comes together in less than 45 minutes. So there ya go. All in all, it was an okay week. It wasn’t the most stellar, but I think I took enough kitchen breaks to give me a little stamina to get through this last ten days. How is YOUR pantry challenge going? It was a good week in that we are still plugging away on the things we have and I am starting to see a little bit of white space in the big freezer. It was a bad week in that I wandered into the store for a couple of needed items when I was not in a mood of resolution and so picked up things I probably should have passed on. We’ll use them, they aren’t wasted, but they weren’t necessary right now. Oh well. At least we are enjoying the eggnog we expected would already be gone for the season but found still in the store! Now I really have to close the wallet for the rest of the month as I’m already $25 over what I was hoping would be the max for the month. I didn’t get much baking done this weekend so I’ll need to spend a little time throughout the week. We’re low on bread and could use a muffins and granola bars pick-me-up. Nothing very creative was made this week which in pantry challenge speak translates to “we still have plenty of food!” So far I’ve spent about a fourth of our usual budget and I estimate needing to make one more trip this coming week for fresh produce and dairy. Really hoping to stay under $300 and if I still to my plan I will!! Dinners included Black Bean Quinoa Tacos (beans from the freezer), Orange Chicken (orange from our tree; chicken from the freezer), Ultimate Southwest Scrambled Eggs (eggs from our hens), Ham and Potato Soup (stock and ham from the freezer), quesadillas, spicy chickpea pitas (chickpeas from the freezer), and Beef and Cabbage Stir Fry (ground beef from the freezer, cabbage fresh from the garden). I didn’t write down breakfasts or lunches, but in general breakfasts are cold cereal or oatmeal or eggs (and one morning we had LO waffles from the freezer). Lunches are either sandwiches (PBJ or tuna lately) or leftovers from the previous night’s dinner. Side salads, veggie sticks w/ homemade ranch dip, and fresh fruit typically fill out our meals. I did some shopping for fresh produce, bulk oats, corn tortillas, frozen OJ, sour cream, canned tomato sauce, canned diced green chiles, canned Great Northern beans, milk, and cold cereal. Grocery spending is up to $94.63, so I’ll be cutting it close if I’m to stay under $100 for the PC. Didn’t see any too-good-to-pass-up deals in the grocery ads today, so if I limit any future purchases to milk, bananas, and lettuce, I just might make it. We’re plugging along during the challenge. I had to go and buy some chicken and fish because I was down to only red meat in the freezer but so far I’m still at half of what I normally spend for the month. We are all out of fresh veggies so I’m relying on the frozen ones for now. We still have a nice variety of fruit which we eat every day. Our yogurt supply is still ok. I have all kinds of loaves of bread in the freezer and still have some Christmas cookies. I also have a sliced banana bread and an apple coffee cake in there. So no lack of sweets around here even though my hubby is the only one eating them; I’ve all but given them up. One night with some of the chicken I had, I made a chicken, spinach, and tomato skillet over spaghetti which lasted about three days. On the third day, there was only enough for one of us, so hubby got that and with the leftover uncooked spinach, I sautéed that in some garlic and olive oil and added some canned low sodium tuna fish to that and put that over some of the spaghetti for myself. That was so good and a nice way to use up the last of the pasta and spinach. Another night, I used a canister of stove top stuffing to make a stuffing casserole out of tomatoes, turkey bacon, swiss cheese and ricotta and the ricotta is all that I had to buy for that meal. Another night, I made salmon burgers from some pouched salmon I had in the pantry. Over the last two nights, I defrosted the last two freezer bags of meat sauce and we are eating the last of that tonight. I still have quite a nice variety of things in the freezer to last a few more weeks but it’s not overwhelming. I don’t anticipate a visit to the grocery store for the remainder of January and that would have gotten me to my goal of spending 1/2 of what I normally do. We will probably keep our spending under $110 for the month. We will only need milk, lettuce, sandwich bread and fruit. our 2 adopted sons are living here otherwise our bill would be lower but ya gotta do what you gotta do! 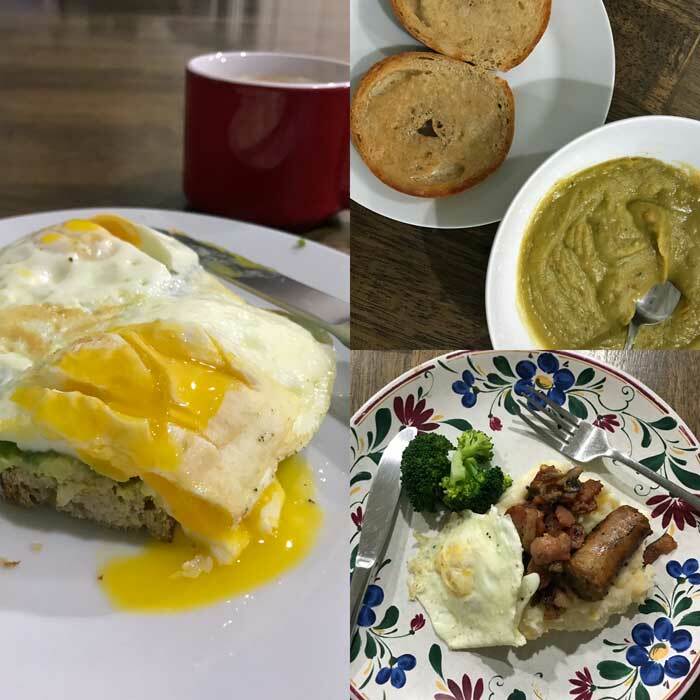 Our menu this week included l/o bbq brisket sandwiches on homemade hamburger buns, homemade twice baked potatoes with broccoli and cheese, chicken bacon subs with l/o soup from the freezer, breakfast casserole with l/o pancakes from the freezer and chicken stir fry over rice. Sunday the who;e family went out for dinner for my husband’s birthday and this Saturday is a 50th anniversary pot luck. We had a very easy week!! My husband is out of town and so my 8yo and I have been eating down our freezer and pantry to limit grocery trips and cooking while I’m on my own. 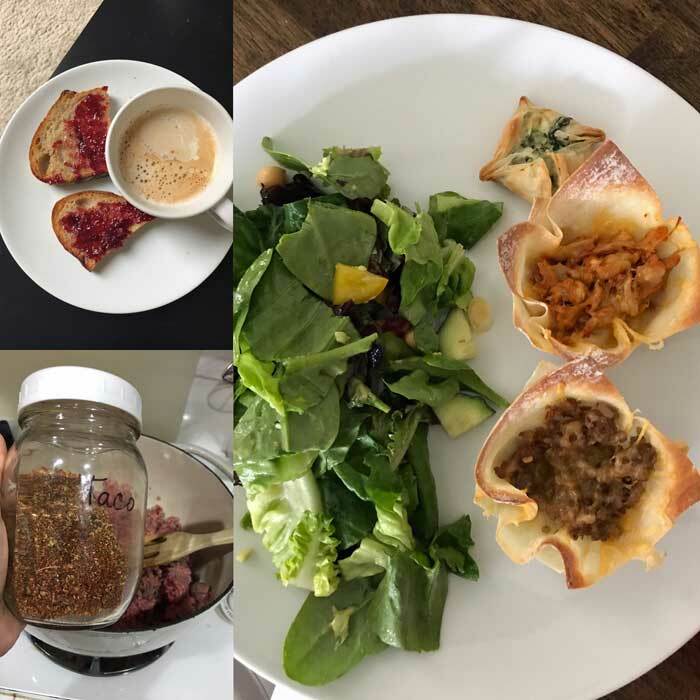 I was thinking – oh hey it’s January – I bet the Pantry Challenge posts are up! So I have been binge reading your posts for the month for encouragement as I push through the last 5 days. Thanks for doing this every year and good luck with the housing situation (we live on the east coast in another HCOL area).